For centuries, Japan was defended by a class of warrior poets (well, I assume at least some of them could rhyme...) called The Samurai. These honor driven soldiers served their lords and their families by closely adhering to a code called Bushido. I’m sure you all know this stuff the same way I do, from watching the historical documentary known as “The Last Samurai” where the sole white guys shows all the Japanese what honor really means (its weird how that always happens in movies...Mighty Whitey? ), but I digress... (I’ve always wanted to write that). Today, many have forgotten that the Japanese chose to name only one car after this warrior tradition more than 30 years ago. Some would even say that car should be forgotten, and the ones remaining should be left to vanish. I think that when Suzuki was looking to invigorate its sales of its small peppy non-jeep and chose to name it Samurai, they couldn’t have made a better, more representative decision. How was a car from Japan not named samurai before or after this? obviously the answer is because no others before or after were worthy of the honor and the burden of the Bushido Code (ok, also probably copyright laws, but I am pretty sure that honor was the larger consideration). Now I know you are saying or thinking something like: ‘But how can this be! what about INSERT CAR X HERE (probably Miata, S2000, or Toyota Camry or something. OK who said Camry? GET. OUT. NOW. )‘ or maybe: ‘No way! samurais are rollover death traps that are way worse than INSERT CAR X HERE (probably some form of jeep, or a horrible land rover like Doug Demuro’s that cost 70000$, PS SHOUT OUT DOUG!)‘. The Samurai is definitely righteous. Its fully committed to being an offroad vehicle. It is set-up for lightness, high torque, short wheel base, and large approach/departure angles that to this day cant be beat by any stock ‘off-roader’. its got no frills to break, unlike the jeep of the time, and its built on a true solid axle ladder-frame base. Also, its got righteous stripes! Think about this: 63 hp. wait...WHAT!?!?... that’s right...63 HP! That’s all the samurai has stock. Think about driving up to some Jeeps or other offroaders with 3 or 4 (or much more) times the horsepower. Then having them realize that your 63 hp can take you as many or more places than their souped up mega machines. Its like bringing a knife to a gun fight...no... more like bringing a pool noodle... but still being able to fight! The Samurai is benevolent and compassionate. My samurai has a winch on it (actually a winch was a stock option), though the Samurai has never needed it, it has seen action benevolently and compassionately pulling other vehicles out of obstacles that I just crossed. The Samurai respects the Earth. It weighs just a hair more than 2000 pounds, and gets good gas mileage (lets see almost any other offroad/on road vehicle come close to that weight). sooo... its eco friendly, right? Because it doesn’t use a lot of materials? Yeah. Good enough. 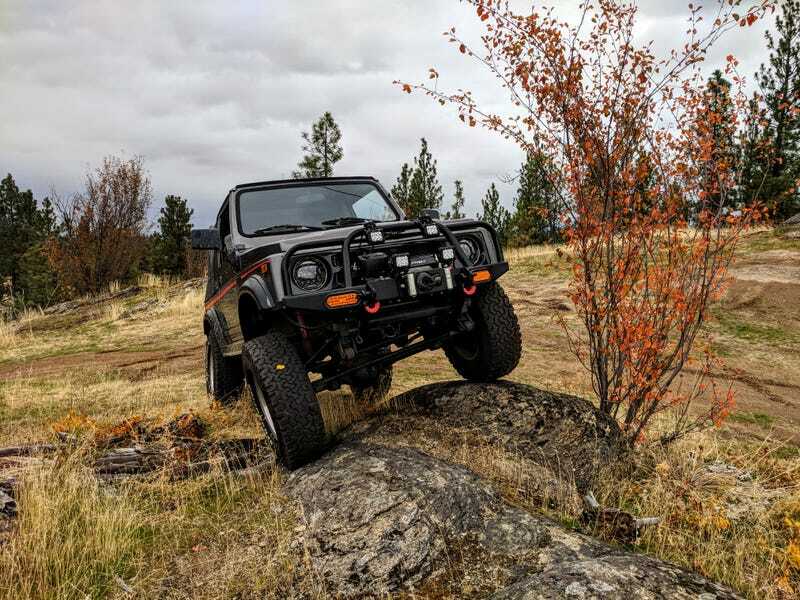 The Samurai doesn’t use new fangled tricks like electronically locking hubs, or remote disconnect sway bars, or power steering to accomplish its goal. The samurai relies only on old fashioned straightforward engineering. Solid Axles, Ladder-frame, true 4 wheel drive transfer case, huge approach/departure angles, leaf springs, all the things that other vehicles have to modify (or use unreliable future magic) to achieve. Suzuki Samurai = Simple Construction = Reliability = easy/cheap repair ability. Last year I replaced the transmission (after 30 years, and lots of good off roading duty). Whats funny is that I knocked a hole in it with a rock and didnt notice that it had no oil.. it started to make a funny sound but otherwise drove fine...for 3000 miles before I noticed! I put oil in it and the noise went away, but I couldnt patch the hole, so I had to replace it. It weighed 80 pounds, and cost about 500.00$. FOR A TRANSMISSION! I bench pressed it into place, didn’t even need a jack! It has also never broken down on me on the trail, and I could sit in the space in the engine bay making working on it a breeze. That’s the best description of Loyalty and duty in a car that I have ever heard. You cant really get speeding tickets in the Samurai. Its impossible. Dont argue with me on this. This car is the picture of self control. everything happens slow, quiet, and fun. Plus you can take off the doors! NO DOORS = BEST TIME EVER!!! But hope is not lost for these heroes of the hills! Prices are going up, but you can still get ‘em cheap if you look. So Don’t let the sun set on these awesome little beasts, pick one up and enjoy the mountains safely!